VATICAN CITY (CNS) — Confronting a rebel archbishop’s accusations and acts of defiance was the heaviest cross Blessed Paul VI had to bear in his pontificate, said a new book based on never-before published notes and documents. After years of correspondence and efforts at convincing Archbishop Marcel Lefebvre, founder of the traditionalist Society of St. Pius X, to accept the teachings of the Second Vatican Council and the authority of the pope, Blessed Paul lost his patience at times in a private meeting with the suspended cleric at the papal villa in Castel Gandolfo, Sept. 11, 1976. “You said it and wrote it. (That) I would be a modernist pope. By applying an ecumenical council, I would betray the church. Do you understand that if this were so I would have to resign and invite you to take my place and lead the church?” Pope Paul said, according to a top Vatican official’s report of the proceedings. 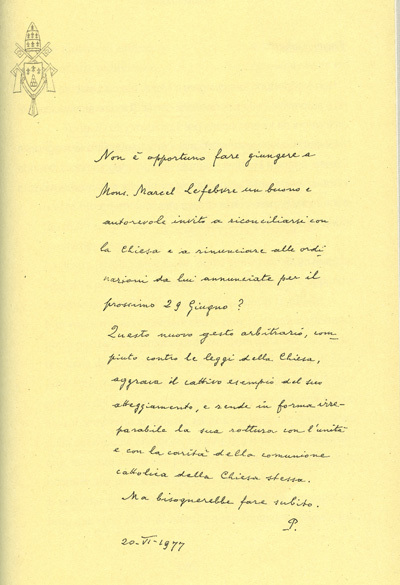 The typed report and handwritten notes and letters of Blessed Paul are part of a new Italian book, “The Barque of Paul,” by Msgr. Leonardo Sapienza, regent of the Prefecture of the Pontifical Household. The book makes public more than two dozen handwritten or typed notes and letters by the pope, including a letter long-rumored to exist instructing the dean of the College of Cardinals to accept his resignation in case of infirmity. But the most “dramatic are the documents on the matter of Lefebvre,” said an article published May 15 in the Vatican newspaper, L’Osservatore Romano. The book focuses on the pope’s comments and reactions in 1976-1977 when the situation with Archbishop Lefebvre had reached breaking point. At length the pope condemned the false and “inconsistent” doctrine, and the grave and divisive actions of the archbishop during a secret consistory with cardinals May 24, 1976, the book said. The times, the pope told the cardinals, called not for concessions, but vigilance against all dangerous and incorrect interpretations of the Second Vatican Council. Just a few months later, in July 1976, Archbishop Lefebvre was suspended from his priestly functions after he illegally ordained 13 priests at his seminary in Econe, Switzerland. In an open violation of his suspension, he led a Mass at a sports arena in Lille, France, Aug. 29 before thousands of faithful and hundreds of journalists, who reported or broadcast his lengthy homily in which he defended the “traditional” faith and lambasted the “conciliar” church. In the end, after direct correspondence, intermediaries and a number of public statements seemed to have failed to sway the archbishop, the pope met face-to-face with him Sept. 11. The pope’s personal secretary also attended along with the assistant secretary of state, whom the pope charged with taking notes on the entire proceedings. Pope Paul said the question at stake was not obedience to him as a person, but obedience to the office of pope. What bothered the pope, he said, wasn’t the archbishop’s “perplexity” with what the council taught, but his attitude or approach to the council, which he had also taken part in. “I am not against the council, but against some of its acts,” Archbishop Lefebvre said. “If you are not against the council, you must adhere to it, to all of its documents,” the pope replied, remarking later that the archbishop had signed many of the council’s acts. “I am not being judged as I should,” Archbishop Lefebvre replied. “Canon law judges you,” the pope said, urging him to make an examination of conscience of the situation and ask God what to do. The pope said he would reflect as well and pray, reiterating he had much esteem for the archbishop, knew of his merits and had common ground in recognizing there were “many problems” to deal with. “We have to find union in prayer and reflection,” he said ending the 30-minute meeting with prayers.